Last week we talked a little bit about Linux and I introduced you to a program called Slax which served the purpose of being a perfect introduction for those new to this Operating System.The big downside to Slax was that it wasn’t really designed for installing on to a hard drive and so didn’t really lend itself to being used as a long term alternative to Windows. This week we’ll take a look at a Linux Operating System which is designed to be installed either as a direct replacement or installed permanently alongside the Microsoft offering going by the name of Kubuntu. Because Kubuntu is based on the KDE graphical interface those of you that tried out Slax last week will find this variant of Linux extremely easy to get to grips with.Where it differs is that Kubuntu isn’t designed from the ground up to be easily portable and as such it comes bundled with more software and is also easily installable on your hard drive. By heading to www.kubuntu.org you can download the 700mb package free of charge.This software can then be put on to a bootable CD so that your new Operating System can be tried out before you choose to continue with the installation.The problem here is that Kubuntu runs pretty slowly off of a CD so don’t let this put you off putting it on to your hard disk. The first time I used Kubuntu it set up and installed pretty much all my hardware (with the exception of my printer) automatically without any intervention and I was up and running on the Internet immediately.This is pretty impressive when you compare it to the half hour installation routine that is involved when setting up Windows for the first time. Included with the default installation is a range of tools for your graphics, multimedia and Internet applications as well as the extremely capable OpenOffice package which is used as a direct, free replacement for Microsoft Office.I have reviewed OpenOffice for Windows in the past and found it to be quite a capable package consisting of a Presentation, Spreadsheet, Database and Calculator utilities as well as a Word Processor.Of course if you need to use an application that isn’t included as part of the default installation this can be easily done by using the inbuilt add/remove programs manager.A bonus of using a Linux based Operating System is that pretty much all the software that you’ll ever obtain will be legally free of charge. 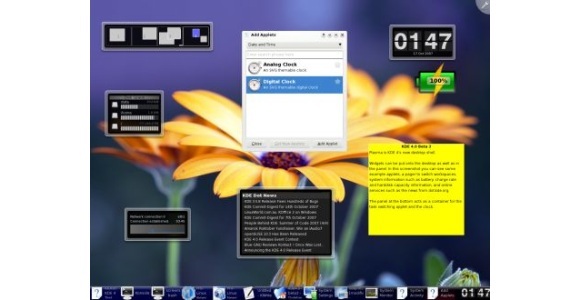 As mentioned at the beginning of this article the User Interface is based on KDE which is fairly similar to that of Windows and so most users shouldn’t have a problem finding their way around the basic functions of the Operating System.The system is relatively easy to use and when installed on the hard disk the performance is impressive especially when compared with Windows on lower specification hardware. I’m certainly not suggesting that Linux is the ideal solution for everybody as to do so would be hypocritical as I personally still use Windows in my day to day life however Kubuntu is certainly worth looking in to especially if you have a lower hardware specification or resent having to pay every couple of years for the latest version of Windows. Pretty much any variant of Linux is completely free of charge so you can download and experiment to find out which one suits you the best however the two versions Slax and Kubuntu I have reviewed are certainly good places to start.